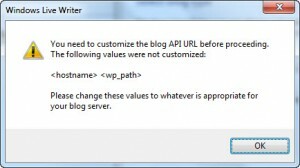 You need to customize the blog API URL before proceeding. please change these values to whatever is appropriate for your blog server. If you also stuck in the <hostname> <wp_path> error in windows live writer then here is solution for it. Check “Atom Publishing Protocol” and “XML-RPC“. It depends on where your blog is installed. After doing all the above steps try again, you are able add you blog to window live writer. No Option there Remote Publishing…..